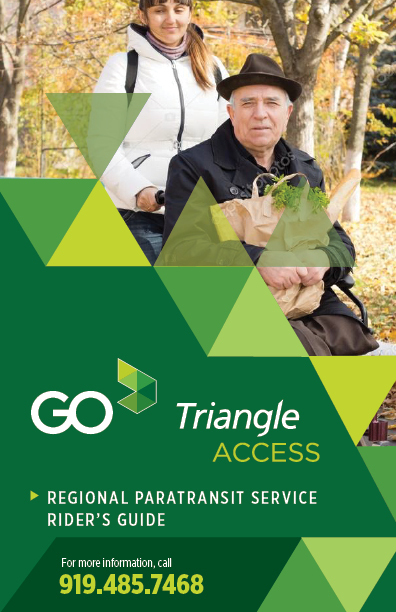 GoTriangle ACCESS (previously called T-Linx) is a regional curb-to-curb paratransit service (with a door-to-door option, upon request) for eligible residents of Wake, Durham and Orange counties. The service is designed for people with disabilities that prevent them from using the GoTriangle fixed-route bus service. All GoTriangle vehicles are wheelchair-accessible and operate for trips among Cary, Chapel Hill, Durham, Raleigh, Research Triangle Park and the Raleigh-Durham International Airport at a cost of $4.50 per trip. Your trip must begin and end within three-quarters of a mile of a GoTriangle all-day fixed-route bus service. Please call 919-485-7468 or click here for specific route information. If you qualify for paratransit service but must travel outside this area, you are responsible for transportation needed to arrive within GoTriangle’s service area. If you are currently ADA-certified with Cary, Raleigh, Durham, or Chapel Hill, GoTriangle will honor those applications. Here's our digital guide. Interested in our Rules of Conduct Policy? Head over to gotriangle.org/rules. GoTriangle ACCESS Paratransit riders may use punch cards, monthly passes or cash (exact change only) to pay their fares when being transported on a GoTriangle ACCESS vehicle. Please have cash, cards or passes ready and in an accessible location before you board the vehicle. Fares and tickets are for one way only. You must also have the exact cash fare, punch card or pass for your return trip. The fare for a one-way trip is $4.50. The cost is $45 for a punch card (11 one-way rides). A monthly pass is $153. Paratransit operators are not permitted to purchase or deliver fare media for paratransit riders. Paratransit operators do not carry or make change. All pass sales are final and are nonrefundable. Lost, stolen or altered passes will not be replaced. Online: Buy passes on our Passes page! To learn about reasonable modifications, the Accessible Services Advisory Committee and additional resources, head to our ACCESS Resources page.